We have survived, Bodie and I; two weeks to the day after he arrived. I have survived the initial housebreaking, the leash training, high energy barking, tail-tucking zoomies and incessant squeaky toy noises in the middle of the night; the stages of raising a puppy. His life is still a picture of contrasts. He’s quiet one moment then barks loudly for attention, shy when the fox yips in the woods, bold when the neighbor comes over to pet him, sometimes his sweet and fuzzy blond face begs to be kissed yet his razor sharp teeth accidentally nip my fingers when we play tug. He’s impatient for treats yet learning to sit first. We have miles more to go in our relationship. In the quiet moments of the morning the four dogs rest quietly at my feet. Three have started their show careers, while the puppy is beginning to eagerly learn the intricate behaviors that I ask of him. They all keep me busy, on an even keel, alive. I wonder how people can live without dogs? Do they not know what they are missing? We pour affection on them and then speak to them in endless soliloquies about our dreams and failures. We fantasize about the meaning of their thoughts and moods and behaviors. Yet the dogs stay by our sides. I remember reading Woodrow Wilson’s quote: “If a dog will not come to you after having looked you in the face, you should go home and examine your conscience.” I must be doing something right. I have four faces gazing into my eyes. Tommie woke me at three a.m. this morning. I’m not sure why. Was I dreaming? Yes, I do remember the dream now, of one day walking in the front door, knowing all my animals had passed on of old age. What next, I remember asking myself. The answer is that we humans do the things that make us feel complete, wanted, useful and loved. It came to me while writing this that perhaps Bodie is not my Last and Final dog. Author Jon Katz says to never give up on love. I remember I snickered when I read his quote, believing cynically that love has given up on me. Perhaps I misunderstood his full meaning. Never give up on love of any kind, from any source, even the love of yet another dog, years in the future. Yes. I like that, another dog that will need my love as much as I need his or hers. 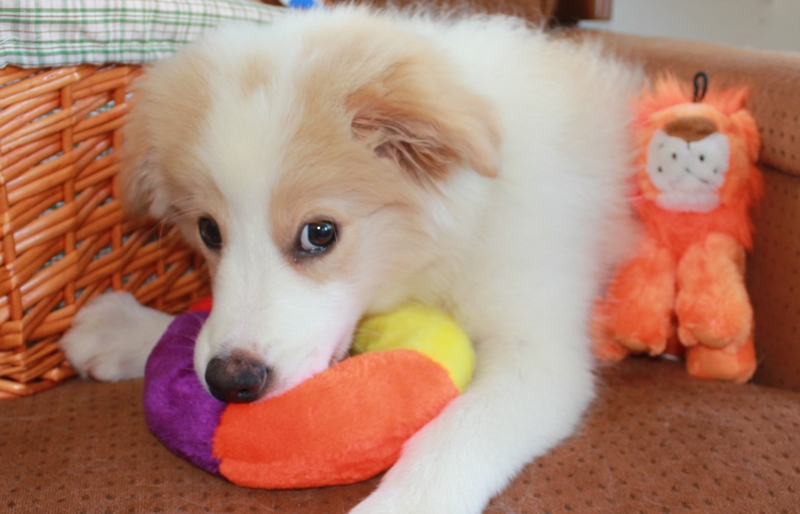 This entry was posted in Dog training, Dogs, Jon Katz, love and tagged Border Collies, Dog training, Jon Katz, Pets, Puppies. Bookmark the permalink. I told you Bodie wasn’t your last dog….. I like the idea of taking in an older dog someday, maybe a retired show dog. Pls, no more puppies! Time change? Not in this house.